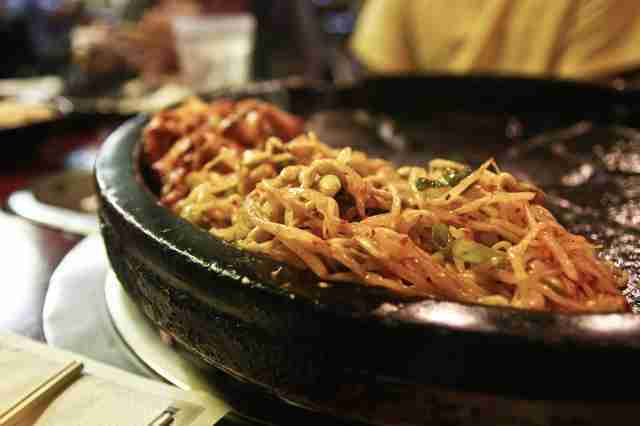 Los Angeles is the best place to be for Korean BBQ gluttons these days. The city is brimming with options -- mostly centered around Koreatown -- that cover all bases: AYCE and à la carte, traditional and trendy, upscale and bare-bones. 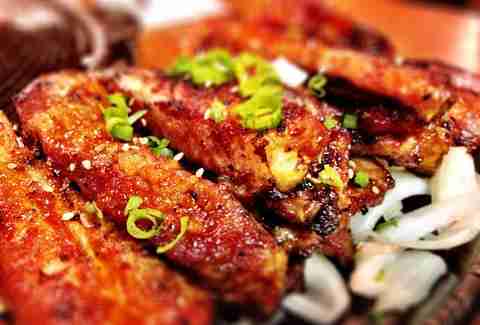 While some passionate enthusiasts will swear by their one-and-only favorite, we’ve rounded up 15 delicious spots that set the bar high in LA and make your post-BBQ galbi-scented clothes totally worth it. LA’s most hyped Korean BBQ joint sometimes commands one- or two-hour wait times, but the place lives up to the hoopla with top-notch meat (like perfectly marbled prime short ribs), servers who make it all for you (so you can focus on grubbing), and specially sectioned grills where eggs and corn cheese cook... at the same damn time. It’s no surprise that Kang Ho Dong’s sister restaurant, Ahgassi, wins big at Korean BBQ, too. This outpost, however, specializes in grilled intestines, like mountain tripe and abomasum (which, FYI, is the name of a ruminant animal’s fourth stomach compartment). 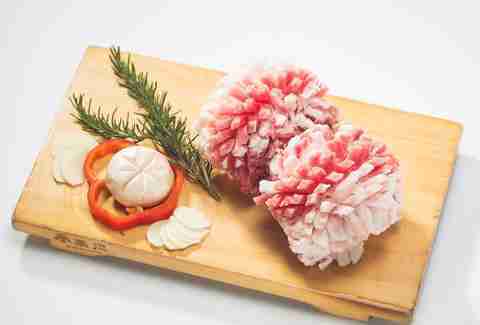 For the best dining experience, get an order of the large intestines -- soft, chewy, gnocchi-esque globs that you’d be hard-pressed to find elsewhere. You can’t go to Ham Ji Park and not order their flawless pork ribs, which arrive tender on a sizzling hot plate and smothered in gochujang -- a fermented chili paste that adds the right amount of kick to the meat’s slightly smoky-sweet caramelization. Though this no-frills spot is on the pricier end of KBBQ restaurants, you cough up extra bucks for good reason: quality cuts of beef, including melt-in-your-mouth Kobe, and their famous short rib soup -- a hearty dish brimming with fall-off-the-bone meat, green onions, and glass noodles in a clear, hangover-healing broth. Sure, you could go for standard KBBQ eats here, like their excellent house specialty short ribs. But for something a little different, we’d recommend Soowon’s pork neck -- a cut of meat that’s exquisitely soft, juicy, and crunchy all at once. While you’re at it, ask for a bowl of naengmyeon, a refreshing cold noodle soup that cuts through all the fatty meat you’re inhaling. If you look forward to the banchan (the tasty side dishes) as much as the meat, Genwa’s your jam. This sleek, stylish spot serves a parade of 20+ banchan along with your meal, so you’re lucky to have room left over for their boneless short ribs, pork belly, and raw-egg-topped steak tartar. And definitely don’t leave without asking for the Seoul Train (it involves beer, soju, and chugging all of the above, dancing is optional). Get ready to pig out -- literally. This spot is known for their “8 Flavors of Pork Belly,” featuring the meat in different flavor-enhancing marinades like wine, garlic, and curry. Each slice is so thick that right when it’s been grilled to perfection, a server will materialize to scissor-snip it into easily chewable nuggets. 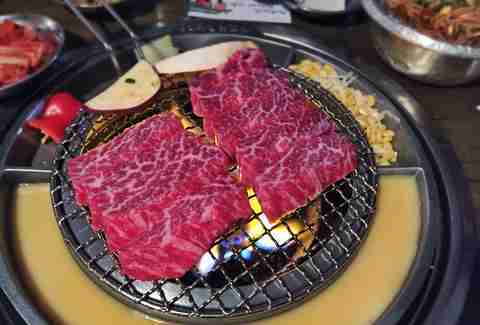 Mapo isn’t a traditional KBBQ spot, so hit this hole-in-the-hall when you want to change it up. They’re masters of spicy chicken (not the usual beef) BBQ, which they fry up with a hodgepodge of rice cakes, veggies, hot chili sauce, sesame leaves, and even a layer of cheese, in a large cast-iron pan... right in front of your drooling face. 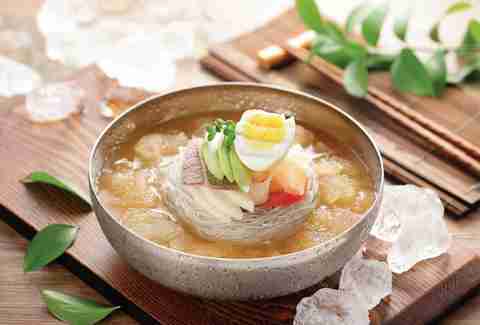 While this AYCE spot doesn’t have Kang Ho Dong’s brand-name recognition, who needs it when there’s zero wait time and unlimited refills of soy bean soup and steamed egg? Their cheapest dinner set, which includes beef finger meat (the stuff in between the ribs), squid, tripe, pork belly, and countless more, sets you back only $20. The crowd-pleaser at this newish joint (the original is in Rowland Heights) is saeng bulgogi, a pile of unmarinated beef, mushrooms, spinach, and green onion; cooked (by you) in a semi-sweet broth; and then served with glass noodles toward the end. A minimum of two orders is required -- which can easily feed three or four, depending on how hangry you are. You’ll sometimes hear KBBQ aficionados talk about how AYCE spots don’t serve good-quality meat, but Hae Jang Chon is a notable exception. 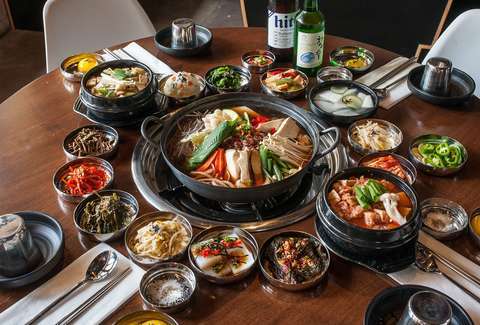 Their menu boasts a diverse selection of top-shelf cuts (everything from pork shoulder to beef tongue); plus, they top off your meal with table-side-cooked kimchi fried rice, which absorbs all the oil from your just-devoured BBQ. Quarters sits in the same plaza as its more famous cousin, Kang Ho Dong (they’re owned by the same family), but has a more rebellious streak. After all, what KBBQ spot serves a melted cheese dip that you’re encouraged to dip your pork belly into, kimchi-topped Korean nachos, and beer-ritas -- all to a fist-pumping EDM playlist? 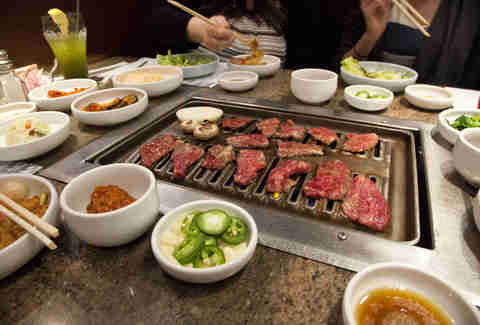 Clean, upscale, and yes, a little costlier than your average K-Town outpost, Chosun’s where you go to enjoy impeccable service and a full bar (somewhat of a rarity in KBBQ restaurants) along with your meat -- like juicy unmarinated brisket and rib-eye steak. This long-standing spot still does things the OG way, serving thick slabs of meat (versus machine-sliced thin) and using charcoal grills that add a distinctive smoky flavor to it all. 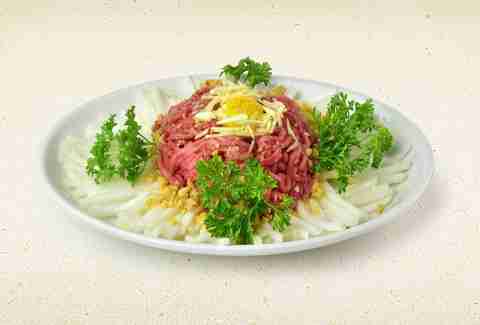 You’re also encouraged to wrap your meat in the provided lettuce leaves, along with a bit of rice, garlic, and chili paste for a two-bite-sized package called ssambap. 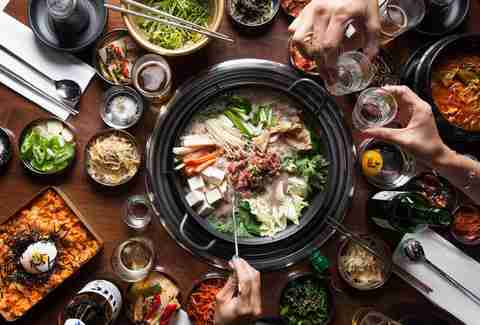 As a KBBQ restaurant in Culver City, Hanjip -- the brainchild of Seoul Sausage Co. founder Chris Oh and his partners -- faced judgment from the start, but both Westsiders and Eastsiders have given this less-than-traditional spot their stamp of approval. The menu’s obvious star is the $150 dry-aged Tomahawk steak with foie gras butter, but the most interesting dishes are Korean classics with a twist, like bone marrow corn cheese, brown butter-infused kimchi fried rice, and a crisp seafood pancake stuffed with rock shrimp and scallops. Tiffany Tse freelances for Thrillist, and loves fist pumping in between bites of pork belly. Follow her on Twitter at @twinksy and Instagram at @twinksy.